Hello! We're Paper Studios and we create original content! We're currently looking for an experienced Sound Mixer for an upcoming shoot over three weekends late April/early May. 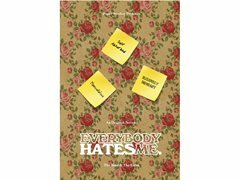 'Everybody Hates Me' a six part comedy series that follows three neurotic frenemies as they navigate day to day adventures in their eccentric hometown of Cityville. It's a little bit Seinfeld, a little bit 30 Rock, with a touch of Broad City thrown in. We love irreverent and absurd comedy, so if this sounds like you then please get in touch! The show has a heavy emphasis on style and Art Direction, and is jam packed with fast paced dialogue and wacky scenarios. Payment is $250 per shoot day. There would be a few pre production meetings but these will take place closer to the shoot dates. We also have access to a high end, reputable post production house that will be covering edit, grade and online/VFX work. Previous experience with on set sound mixing essential. We will be using both boom and lapels.